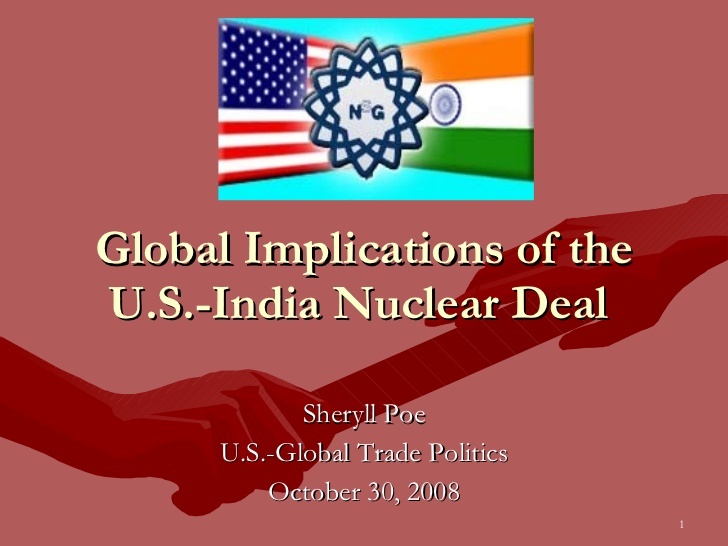 The 2008 India-US civil nuclear deal is marked as one of the most significant events in the strategic landscape of South Asia in last 3 decades. This deal has been viewed as the beginning of a special relationship between India and the US. However, after signing the nuclear deal, the first strategic dialogue between India and US took place in 2010 at Washington. It is unfortunate that since its inception, the strategic implications of the deal on the South Asian calculus has remained the most significant part of the debate. This research aims to analyze various dimensions of Indo-US strategic cooperation which include nuclear politics in South Asia, arms race instability, Non-Proliferation, and regional security and stability. The aim of the India-US partnership was to enhance India’s strategic role in South Asia while ignoring the impact on the regional stability and states especially Pakistan. The civilian nuclear agreement between India and the US is a comprehensive framework contract, comprised of multiple agreements. The 2005 deal is considered as very facilitative in nuclear commerce and trade. Therefore, various agreements have been signed between both states after the operationalization of nuclear deal. Subsequently, in order to engage in nuclear commerce or trade, various changes have been introduced by the US in its domestic laws, and the most important step was the provision of NSG (Nuclear Suppliers Group) waiver to India. The intense and heated debate on the nuclear cooperation agreement between India and US has remained focused on the following three issues: First, the impact of a nuclear deal on Strategic Stability on South Asia; Second, implications of the deal on arms race between India and Pakistan; Third: non-proliferation implications of the deal. The strategic partnership is viewed as the foundation to India-US nuclear deal comprised of rebalancing actor in the region, a pivot of Asia and a key actor in “Indo-Pacific” policy of US. Pakistan’s strategic analysts have shown their concerns on the India-US strategic cooperation as it has the ability to disturb the Balance of power in the region: which is dangerous for the peace and security of regional states. Under the Indo-US nuclear cooperation, India insisted that its own nuclear armament plans will not be affected by nuclear cooperation with the US. This factor has threatened the region with a new arms race because regional counterparts; Pakistan and China are likely to respond to India’s nuclear weapons buildup to ensure the deterrence equilibrium in the region. This factor instigates arms race instability in the region. The indo-us nuclear deal is a question mark on the spirit of the non-proliferation regime. As per article I of NPT states that there shall be no transfer of the nuclear technology from the NWS to the NNWS, but it does not address the transfer of technology from the NWS to another NWS. Despite being Party to the NPT, the US has assisted India in nuclear technology since the early 1990s. Similarly, the Indo-US nuclear deal has provided a special waiver to India for the NSG membership that aims to assist India in enhancing its nuclear arms capability. The Indo-U.S. nuclear deal allows India poses a serious risk to regional and global security. This also permits other nuclear states like Russia and China to sell their nuclear technologies to other states. Such nuclear deal reveals about the discriminatory international system and the role of hegemonic powers in changing the global norms. Furthermore, under the nuclear agreement, India has been granted the NSG Waiver that is against the norms of Non-proliferation regime. Therefore, such arrangements have definitely weakened the NPT and its mission of preventing nuclear proliferation. Therefore, ten years of India-US strategic partnership has brought immense repercussions on the strategic landscape of South Asia. Since 2008, the United States has been pursuing the policy of discrimination and nuclear exceptionalism towards India. This factor is posing dangerous impact on regional stability and security, arms control efforts, instigating arms race instabilities and weekend the Non-proliferation Treaty and multilateral export control regimes.